The Holmes Theatre is named For E G Holmes who was born in New York in 1841. After serving in the Civil War – and seeing action at the Battle of Bull Run- Holmes married a young lady from St. Cloud, Lucy Sherman, and they arrived in Becker County in 1870. In 1871, Holmes opened the first General store in our village, then known as Detroit, and the first Bank in 1872. He served on the board of commissioners and was a Minnesota State Senator. 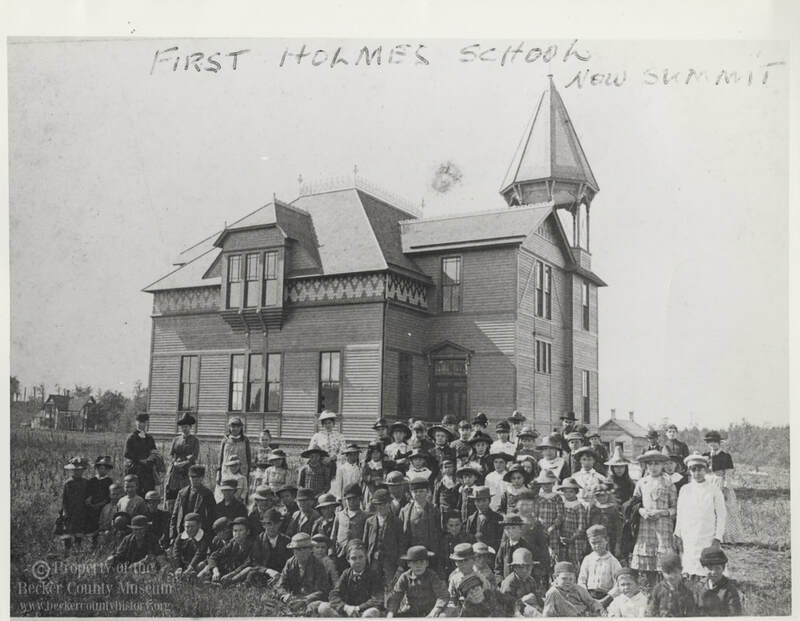 In 1895, the Holmes School was built at the corner of Summit and Front Street. It was built of stone taken from area lakes and horse drawn wagons were sent out to pick up the children as school transportation. Over the years, two sections were added to the school. 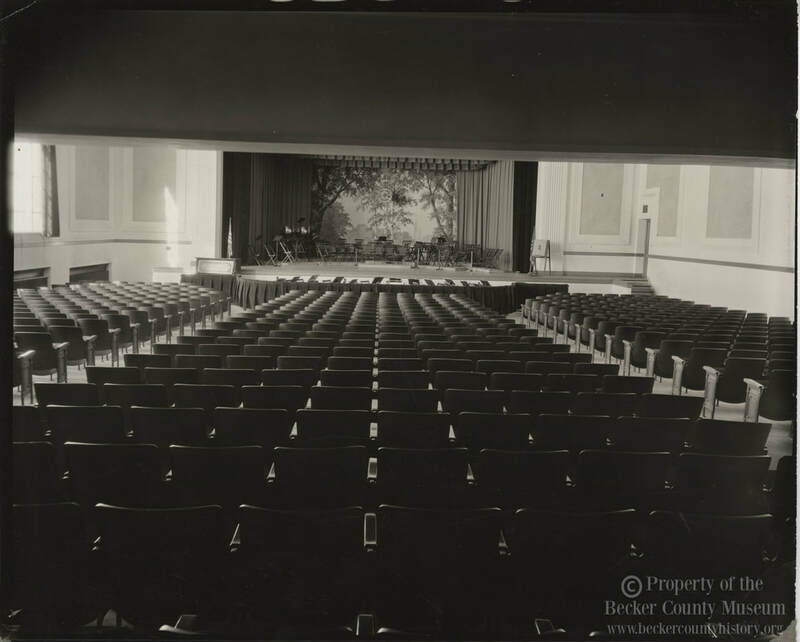 One addition was added in 1909 and the third section, now the Historic Holmes Theatre, was added in 1931 – it included the stage and auditorium and was constructed in an Art Deco style. For decades, the Holmes School was the school for local students, serving as a grade school, the senior high school and the junior high school. The last year the Holmes served as a school was the 1977-78 school year. After that, Jr. High students attended what is now or DL Middle School. On September 20, 1980, the 1909 addition and a portion of the original 1895 school burned down. Workmen had been cutting pipe in the basement of the 1909 building (which had been scheduled to be demolished) and sparks are believed to have ignited the old wood or insulation. Fire fighters battled the flames for hours - The school bell fell down into the basement. Officials had to shut down the water treatment filtering system in order to have access to water quickly enough to put out the fire. Approximately one million gallons of water were thought to have been used. 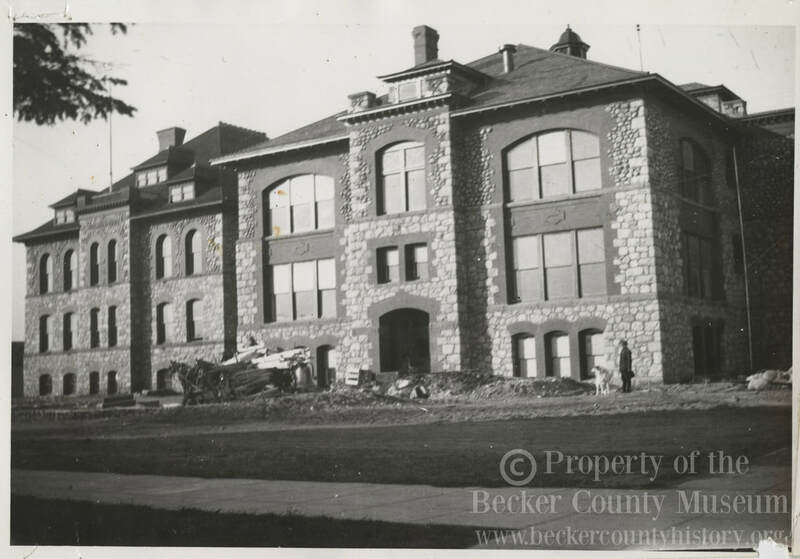 Unfortunately, the 1895 building which was to become the home to the Becker County Historical Society suffered too much damage and was torn down along with the 1909 building. The 1931 addition, suffered minor damage –mostly smoke damage- because thankfully, the fire doors were in place and working. 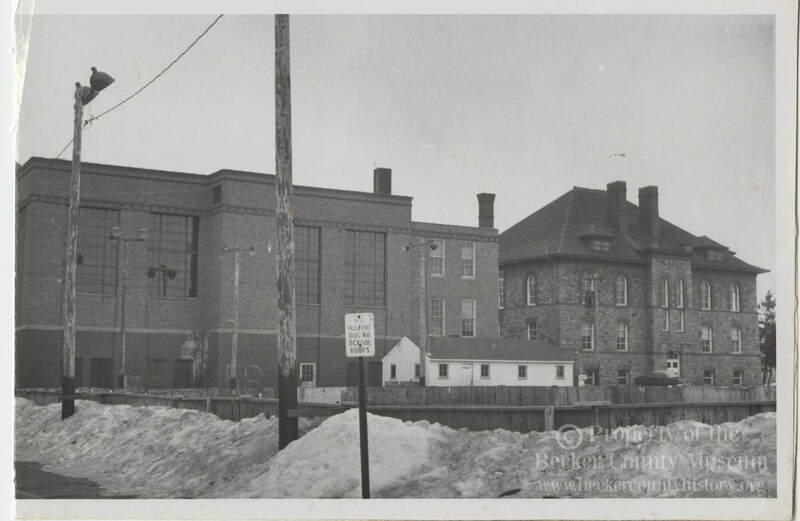 So, the building was cleaned up and used for the Senior Nutrition Center, Playhouse 412, Becker County Food Pantry and the old gym was rented out. The bell – which was dedicated to the school by E. G. Holmes, himself in 1909, and which now sits outside the Holmes Theatre, was obviously rescued. Curiously, it was built by C S Bell Company of Hillsboro, Ohio- a company that built numerous bells for US Navy ships. the Holmes got a new lease on life in 2002. What's with all the pennies? In the Fall of 2013, the Historic Holmes Theatre, in co-operation with The Real Estate Company, began collecting pennies from students around the region including Detroit Lakes, Lake Park-Audubon and Frazee. More than 600,000 pennies were collected. Over the next 9 months, with the help of 1000+ volunteers ages 2 – 85, the loose pennies were transformed into a fabulous new, cost effective, creative and resilient penny floor. Over 630,000 pennies cover about 2,000 square feet. About $3,000 for flooring supplies. Labor and most pennies were donated. Plus, we received a grant from the Lake Region Arts Council to create the floor. Where did the pennies come from? The majority of the pennies were donated by individuals who brought in their mason jars or small baggies full of pennies, but we even had pennies mailed to us from around the country. Also, in conjunction with the Real Estate Company, school groups were challenged to bring in pennies and help install pennies into the floor. Over 1,000 individuals from students and families, young and old (youngest age 2, oldest 90+), touring artists and local business owners. 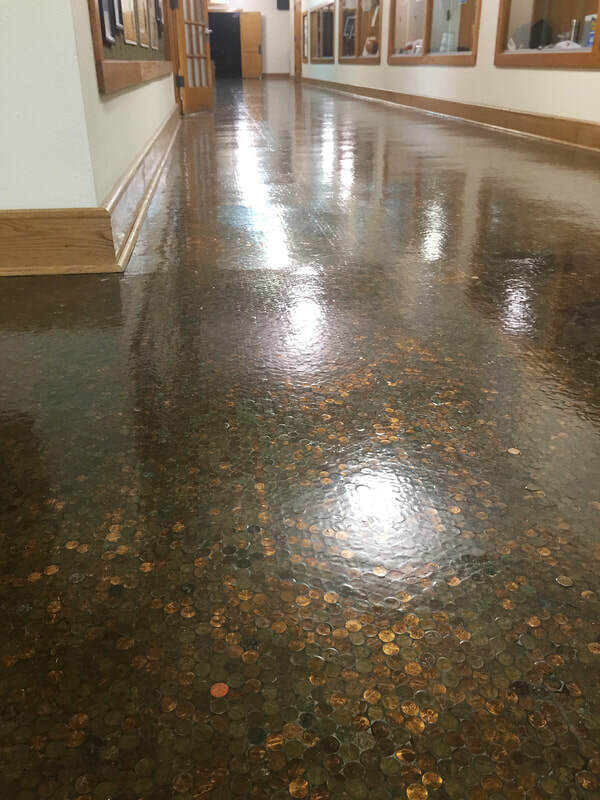 People from all walks of life literally “gave us their two cents” in time or actual pennies to help create the floor. Absolutely! The U.S. Government has decreed that using pennies in this manor is perfectly legal. However, if there is ever a shortage of copper in the United States, the government has the right to dig up the floor for its copper.